How as singers can we fit ourselves into regular society while still be satiated artistically? I was recently on a family vacation at a famous Zoo. We were taking a bus tour through the zoo and our tour guide/bus driver began singing to us. She had a lovely musical theater soprano voice and had re-written lyrics to famous music theater songs about the zoo and its animals. It was a real surprise. She freely and comfortably sang beautifully throughout our tour to us. She was not paid extra to do so I am sure. The other tour guides were not singers and did their tours “regular”. It was interesting as a voice teacher and singer myself to be sitting there having this woman serenade me. I was impressed with how comfortable she was singing to strangers who had not “signed up” for a singing tour. I was also impressed with how talented and natural she was as a singer. It’s overwhelming “HOW MUCH TALENT THERE IS OUT THERE”, what little opportunities singers have, and how she created an opportunity for herself despite the odds. It is very hard to be a paid professional singer. I am sure she would love to be being paid to sing on the stage, and maybe she will be one day. But for now, she found a way to still sing while earning her rent. We all have to live in our lives. Singing is wonderful, but as we get older, bills do need to be paid. I speak often about different job ideas for singers to carry us through. This job, as a bus tour guide through the zoo, was not for singers, but she filled it with singing. Power to her. It was not necessary for her to sing for us, but she gave us that part of herself anyway, without being paid extra for it. That is someone who truly loves to sing. She was willing to offer her voice up as a bonus to us; taking the time to write lyrics to songs about animals, warming up her voice properly to sound good, just because she loves to sing and has a gift to share. It was extremely generous of her to be that vulnerable with her talent with us without being paid specifically to do so. I wonder how many of us would do such a thing? If all the tour guides were hired to sing, it would not be such a big deal in my mind. It was the fact that she chose to give the extra part of herself because she is a singer which moved me. We need to make our own opportunities to live our lives as the musical artists that we are. Most often these opportunities will NOT be given to us. She could have taken the job and done the tours all day without singing coming home feeling empty wishing she was singing for her job. But instead she created a fulltime singing position for herself. As a result, everyone will remember her, and know her as a singer. 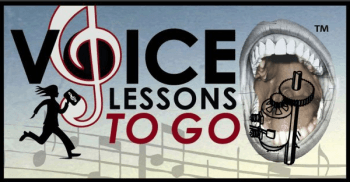 Voice Lessons To Go CDs.